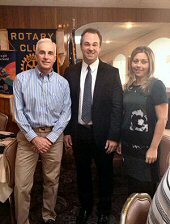 On Tuesday, October 6, the Rocky Point Rotary welcomed Steve Tricarico, Deputy Superintendent of Highways and a community leader in the Town of Brookhaven. Mr. Tricarico detailed two of the projects that were recently completed by the Town of Brookhaven on the North Shore. These projects included the upgrade to Broadway in downtown Rocky Point and the paving of Randall Road in Shoreham. Mr. Tricarico also fielded questions from Rotarians on topics that included storm water remediation on the North Shore and traffic congestion during the fall months on Route 25A in Shoreham/Wading River. Thank you, Mr. Tricarico, for taking the time to stop by and share some fellowship with Rocky Point Rotarians.